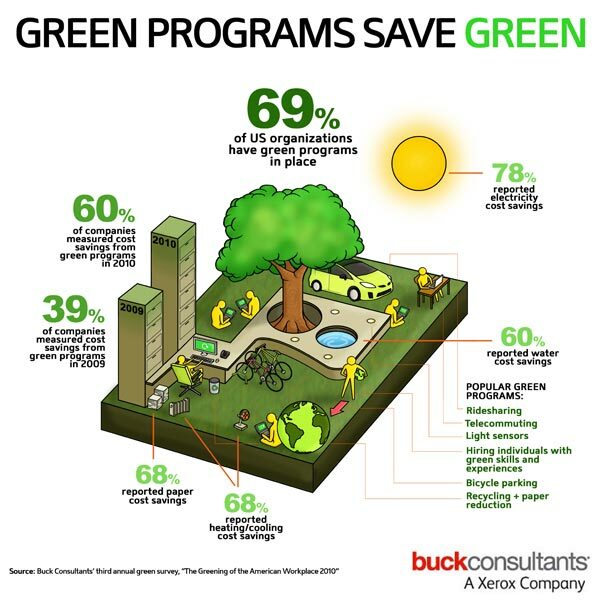 Buck Consultants, a subsidiary of Xerox, has released some data on the state of green programs among U.S. businesses. In its third annual “Greening of the American Workplace” survey for 2010, the firm reports that 69 percent of American businesses have instituted energy-saving and waste- and carbon-reducing programs, up from 53 percent in the prior year. Of those, 78 percent identified cost savings as the leading motivator for hopping on the green bandwagon. It’s a theme that resonates strongly for businesses, especially in tough economic circumstances. What do those programs look like? Paper recycling’s a given, adopted by 97 percent of companies with formal green programs. But technology — Green IT, rather — rates very high as well. Web and/or teleconferencing technologies where adopted by a staggering 95 percent. Light sensors, another techie solution, came in at 75 percent. This statistic bodes well for the burgeoning energy management markets. Just today, there have emerged rumblings that Schneider Electric is expanding into commercial-grade energy management with a possible takeover of Tyco. If accurate, this could be a smart move as businesses — American and otherwise — continue to turn to energy savings as a way to improve the bottom line.